This machine can achieve great things for any sewer in 2018, whether you are sewing a garment design or repair a piece of delicate clothing, or even quilt that warm and cozy quilt. This is a easy to use and yet powerful machine that comes with 18 built in stitch patterns for you to choose from and also includes a 4-step buttonhole feature, to give you a great selection of button options. Having your stitch selection on the front of your machine, makes it easy for you to see them and then apply them as you sew instead of having to stop and refer to the back of the machine like most others. This machine is more so for a beginner and an amateur sewer, as most advanced experts may find it limited. Thread Flow for efficient work, allowing you thread to move smoothly with the top loading system, bobbin system drop in styled that creates a jam-proof system. Foot Control petal will keep you in complete control and command of the speed of this machine of up to 830 stitches per minute. Thread Tension options offer you an automatic setting but you can manually adjust it as well for certain threads that may need some more precise settings to work optimally. Clear Casing over the bobbin covers and protects it while giving you clear visibility for when you have to switch yours out. Four Piece Feed Dogs give you a terrific grip on your fabric that help you push your material through like a breeze. Drop in, top loading bobbin and clear bobbin case make you a well oiled machine while operating. Was able to handle the thickest fabrics that we tried to use including some denim for some jeans that we sewed together for my grandson. Thread Tension adjuster had pin point accuracy that adjusted precisely to the increments that you move it. Horizontal thread delivery gives you a new way of threading that seems almost better than your traditional vertical thread delivery. Few stitch selections than other machines that are around the same price, but with the amount of adjustable features you can achieve more than the preset ones. No case or dust cover but like we always say—just sew one of your own. 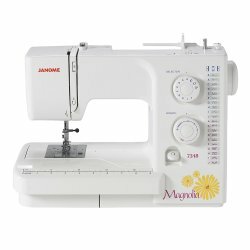 If you want to either start sewing or get back into sewing and you don’t want to learn how to use a computerized model, then this machine is going to be the perfect match for you. The Janome Magnolia is limited with automation features but it still operates effectively like others that do, and if you want to learn how to sew in a traditional way, then this is the machine you must have.